Saudi Arabia is Number 1 country as Top Destination for OFWs in the world last 2016. Saudi Arabia is currently the largest hirer of Overseas Filipino Workers (OFWs) and has the largest Filipino population in the Middle East. Last January to September 2016, Saudi Arabia offered around 117, 696 jobs to Filipinos according to workabroad.ph. 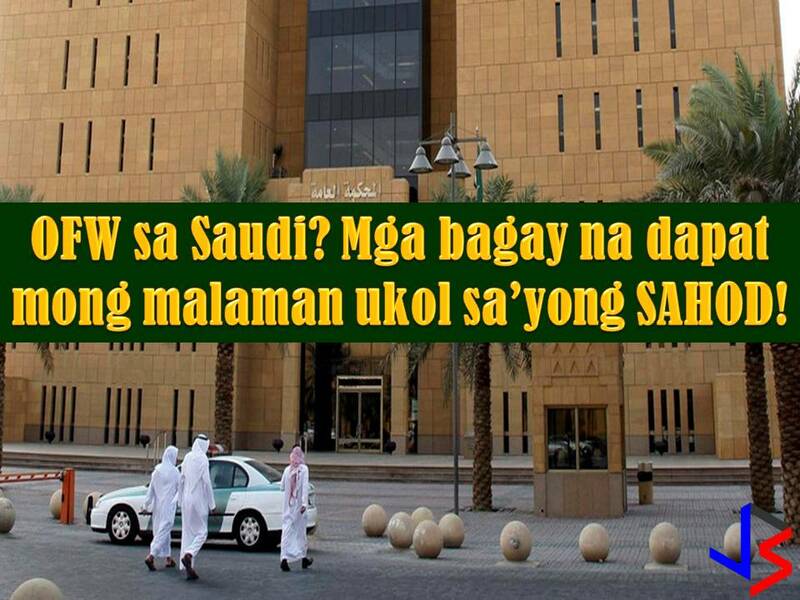 Until now, Saudi Arabia is still opening its doors to thousands of Pinoys who want to work in the country in spite of Saudization. If you are interested in working in Saudi Arabia, you must have information first about an important thing while in the country, laws, policies, rules, and regulation and of course, one of the reasons why you need to go abroad - it gives you a salary, your home country cannot afford. This post is all about wages or salary of an expatriate worker in Saudi Arabia, be it a Filipino or other nationality. Information is taken from laboreducation.gov.sa. The employee's wages and all other entitlements shall be paid in the Country's official currency. Employees paid on a daily basis: shall be paid at least once a week. Employees paid on a monthly basis: shall be paid once a month. If the work is done by the piece and requires a period of more than two weeks, the employee shall receive a payment each week commensurate with the completed portion of the work. The balance of the wage shall be paid in full during the week following delivery of the work. In cases other than the above, the employee's wages shall be paid at least once a week. Wages shall be paid through accredited banks in the Kingdom, provided that their due dates shall not accede the above mentioned dates. If any amount is deducted from the employee's wages for reasons other than those specified in Labor Law without his written consent, or if the employer delays, without a valid justification, payment of the employee's wages beyond the due date set forth in the Labor Law, the employee, his representative or the head of the competent Labor Office may submit a request to the Commission for the Settlement of Labor Disputes to order the employer to return to the employee any wrongfully-deducted amounts or to pay him his outstanding wages. The said Commission may if it establishes that the employer has unjustifiably deducted the said amounts or delayed the payment of the wages, impose on the employer a fine not exceeding twice the amount deducted from the employee's wage or twice the outstanding wages. 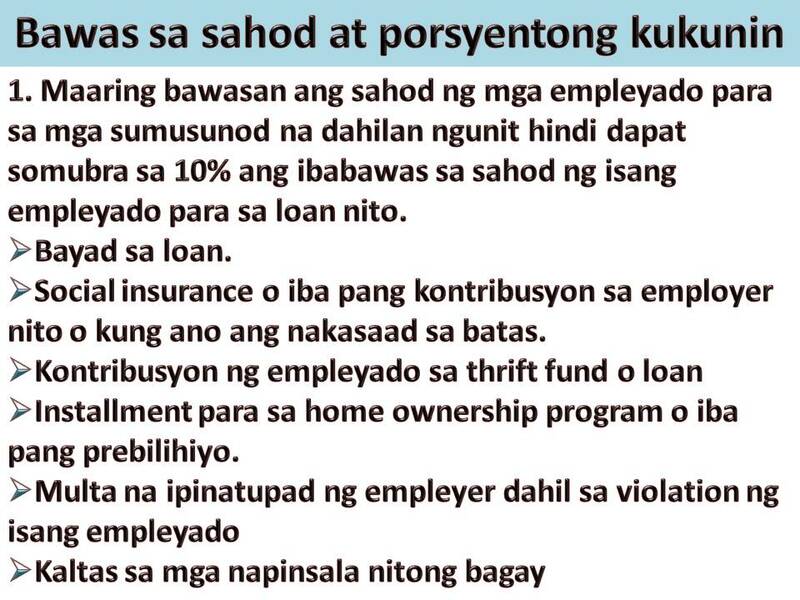 Repayment of loans extended by the employer provided that such deductions do not exceed 10% of his wage. Social insurance or any other contributions due on the employees as provided for by law. Employee's contributions to thrift funds or loans due to such funds. Installments of any scheme undertaken by the employer involving home ownership programs or any other privilege. Fines imposed on the employee on account of violations committed, as well as deductions made for damages caused. Any debt collected in the implementation of a judicial judgment provided that the monthly deduction shall not exceed one-quarter of the employee's wage unless the judgment provides otherwise. First to be collected is alimony, followed by food, clothing and accommodation debts, before other debts. Second: In all cases, deductions made may not exceed half the employee's due wage, unless the Commission for the Settlement of Labor Disputes determines that further deductions can be made or that the employee is in need of more than half his wage. In the latter case, the employee may not be given more than three-quarters of his wage.